Emily and I met originally in an online writer's group. We met in person at the Festival of Faith and Writing, but not before she'd been mistaken for me...twice. Now, we refer to each other as blog twins. Can you see the resemblance? Also at the Festival, Emily interviewed me for an article about millennials and changing views on marriage for Relevant. Maybe you caught it? I hope that you'll enjoy her delicious, heartwarming de(tale) as much as I did. I thought for sure The Kraken was a winner. It met all the criteria: Each slice held its shape after being cut, and the bottom of the tin didn’t flood with juice when it was removed. The fruit was evenly distributed. The crust was flaky and uniformly golden brown. The bottom crust wasn’t doughy and the edges weren’t burned. It also had a dash of novelty, which the judges always seemed to appreciate, passing on to the next round of competition the pies that were decorated with food coloring and cookie-cutter stars or had clever themes. Not only did it have a good amount of Kraken rum in the filling, but also, I had carefully cut the top crust into the shape of its namesake mythological sea creature, its tangled tentacles forming the lattice. The flavors were a take on the Dark and Stormy, one of my favorite cocktails: rum and ginger and lime. Plus, it was just a really good apple pie. It was my idea to enter the Bucktown Apple Pie Contest the first time, according to my husband. It’s the biggest apple pie-baking contest in the country, according to its organizers, and it’s held every year in the Chicago Park District fieldhouse two doors down from the apartment where Joel and his roommates lived before we were married. We all had been apple picking together for several years at that point. Joel had gone apple picking growing up, and he took us to the orchard out in the suburbs he had visited with his family, a good excuse to get out of the city, to breathe fresh air and see stretches of clear blue sky and feel grass brush our ankles. He showed us how to twist the apples and see which ones were ready to pick, to spot ones the ones that had bugs and bruises. We taste-tested all the varieties of apples, noticing which were sweet and which were tart, which were soft and which were firm. 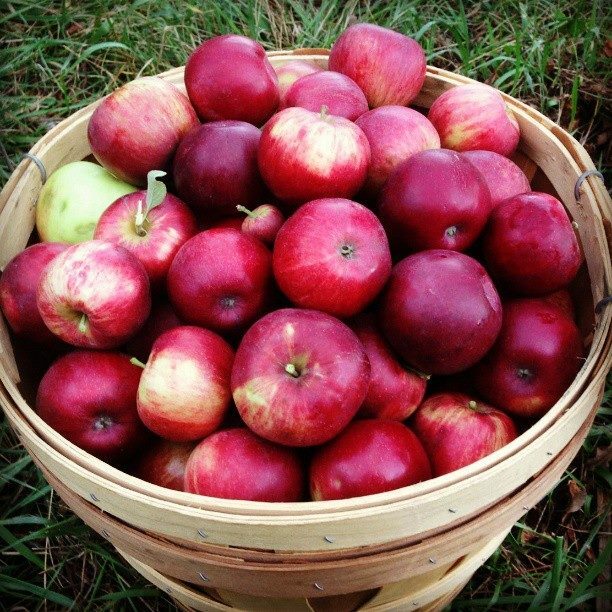 We brought back several bushels – really, an obscene amount of apples – and Joel set to work turning them into apple pies. I’d never had apple pie before, which is a weird thing to admit, sort of un-American. I’d grown up in the Midwest, but my family weren’t a pie-eating folk. We weren’t really a fruit-eating folk either. So this whole apple pie thing was revelatory. We were semi-finalists that year with our “Old-Fashioned” Apple Pie, inspired by the Old-Fashioned, with whiskey and bitters in the filling and orange extract in the crust. We haven’t placed since. The judges thought my Kraken two years later was a cute octopus, although it did inspire #clashofthepietins, one of my cleverer pie-promoting hashtags. “Clash of the Pie Tins” was chosen as the theme for the next year’s contest, and we moved then from competing to judging. Still, traditions like these root us to the seasons, they root us to place and to each other. Summer gives way to fall, and it’s time to for Joel and me to start checking the websites for all the apple orchards within a day’s drive from Chicago. Some years the varieties we’ve settled on will ripen earlier; some years, later. Some years Illinois will have an early frost or a particularly brutal winter, and we’ll drive all the way to Michigan. We’ve gotten to know our neighborhood and the towns around the orchards we’ve visited and visited again. We know about the 1952 Alden-Hebron High School basketball team winning the Illinois High School Boys Basketball Championship and the pizza place being the only thing open on a Sunday night in Berrien Springs, Michigan. We’ve spent late nights together in the kitchen, peeling, slicing and rolling; baking different varieties of apples in white ramekins to see how they break down; and pitting lard crusts against butter. We’ve figured out strengths and weaknesses, individual preferences in crust color and spice. We can pin each contest to a specific point in time – to the year we were engaged, when both our parents came to the contest and met each other for the first time, or the year there was the terrible storm, and heads snapped comically as every phone in the fieldhouse simultaneously blared a warning. “Food, in the end, in our own tradition, is something holy,” said Louise Fresco, a Dutch scientist who specializes in sustainability. Joel and I have been making apple pies together now for five years. The picking, baking and competing are part of the rhythm of our year. It’s something to gather around; part of the stories we tell ourselves and each other, holy and mythic in their repetition, in the way they unite us and shape our identity. And maybe also in the fact that they sometimes include The Kraken. Emily McFarlan Miller is an award-winning journalist and truth-seeker based in Chicago. She is digital editor for social media and engagement for the Chicago Sun-Times and a regular contributor to RELEVANT Magazine, as well as a three-time contestant and two-time judge in the Bucktown Apple Pie Contest. Connect with her at emmillerwrites.com.